Home » Russian Food » 12 Most Iconic Food Brands From Russia You Should Know! Russia is a very nationalist country where they have their own iconic food brand that able to compete with international brands. American food brand or even food chains that receive great response outside America has a different response in Russia. Therefore, there are many iconic food brands that cover most Things You Need To Taste In Russia. There are most Russian most recognize Russian brand that you may only find in Russia. Things such as vodka, chocolate, sweets that are also great for souvenirs. Let’s take a look at our top iconic food brands or drinks you have to try! “Балтимор” is not taken from a city in Maryland, USA, it even has nothing to do with it. This iconic food brand is famous for its ketchup. Moreover, like many huge brands, you can spot this brand among the many Russian commercials and also sponsored shows and tv series. In Russia particular, this ketchup brands is even more popular after sponsoring comedy show “Городок” (“Small Town”), which ran from the 90s through the 2010s. This brand, that can loosely translates to a “country house” or literally, “little house in the village”, a famous brand numerous various dairy products. The brand itself is a typical commercial that portrays country living as healthy and something people long for in the city. Moreover, the brand comes to bring all the best of a country life style to your daily needs. Like many good brands, this also has some memorable tagline such as “Хорошо иметь домик в деревне!” (“So good to have a village home!”) or ”Молоко вкусное, как у бабушки” (“Milk as delicious, as Grandma’s”)—which are both catchy and funny at the same time. Besides vodka, beer is the second best to most favorite drinks to warm you in the cold freezing weather and accompany good conversation in the Russia table. Бочкарёв is an iconic drinks Russian beer brand that comes from the last name which means “barrel.” There are many popular beer brands in Russia, but people remember it for is its memorable commercials and the tagline “Бочкарёв — правильное пиво” (the “right” way to relax). It is certainly a safe brand to choose from what do order besides knowing How To Dress For Russian Nightlife. Stoli is a name that most Russian is familiar with, although being an iconic food in the country you can bet to encounter many other huge and famous brands. Stolichnaya vodka comes from one of Russia’s oldest distilleries, way down in the Samara and Kaliningrad regions. The unique long process to get the unique taste of this vodka is distilled from local white wheat through silver charcoal filters, which highlights a pure, and fresh taste. Moreover, the brands preserve their flavor and bottles which has remained the same for decades. Alenka stands out among the many iconic food brands as a popular sweet that represent Russian. This famous chocolate connoisseur is more than a simple milk chocolate formula, but also the biggest selling domestically produced candy in Russia’s history with socialism background. Therefore, it becomes the nation Most Famous Chocolate In Russia. 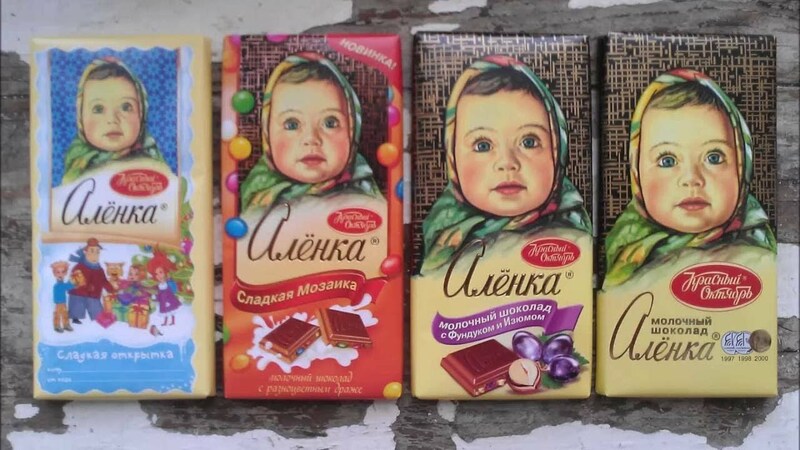 Moreover, the iconic blue-eyed baby covers in a traditional Russian head kerchief symbolize the great classical sweet of Russia that the same taste and packaging in decades. Russian love to preserve food to store when the weather change and the ingredient are not available fresh. Therefore, you are bound to find jams, yogurts, beers in almost Russian shelves. Sweetened condensed milk is one of sweet addition to any snacks that the Russian has managed to influence to their wide varieties of cuisines. The Tasty Russian Snacks That Everyone In The World Should Try use this sticky-sweet concoction for fillings. Moreover, it is the main ingredient to make the famous Sgushenka/ Sgushyonnoye Moloko by boiling them. You can also savor yourself by pour it over Blinchiki (Russian waffle), mix it in for honey cakes, or other addition to cakes and candies. There are many Weird Russian Snacks That Only Made In Russia as part of many unique things to try in Russia. Kvass is a great accompaniment to those sweets treats. Kvass is fermented rye or bread with a mild taste. One of the most famous kvass brands is by The Ochakovsky Food Factory in Moscow. This brand is popular due to is good quality, affordable price, and availability that you can easily find this brand in most big supermarkets. Another widespread and famous food brands in Russian that everyone that curious of Russian flavor must try liquid kissel. The “RosAgroExport” brand is advertised to be healthy with great quality. Kissel in highly influence the Russian culture as “Kiselev” is one of the most widespread names in Russia that always associated with the “seventh water on kissel”. The Russian version of soda that replaces Coca-cola or Pepsi. Russian are extremely proud of their local taste and prefer anything Russian compared to other international brands. These respectful acts help to support the life of much national company growth and the Russian economy. “Chudo-Yagoda”. The English name of this brand is “Wonder Berry”. This brand is well-known in Russia and rather expensive. Russia is famous for classical music, architectures, and sports. Therefore, it is not a surprising fact that Russia develops the first protein ice cream brand. The products highlight a healthy diet suitable even for professional athletes. Moreover, the packaging does not induce any sport elements or patterns more to focus on simplicity that focused more on tastes. If you see many products replacing American food brands is quite massive, Russian also have their own version of Italian pasta. The flagship pasta brand MAKFA is the largest exporter of pasta products not only in Russia but also in other neighboring countries. These include Europe, Asia, North and South American countries which mark their international scales. The cold weather makes any dairy products extremely popular with high on preservation that can be stored and consumed later. Kefir is a mild and slightly alcoholic drinking yogurt. This famous brand with its iconic cat portrays a character from Soviet cartoon “Prostokvashino”. This dairy products hava a very good quality, widespread, and well advertised. Many of these Well Known Foods That Were produces In Russia and become the nation most iconic food brands have earned a well-deserved place as one of the beloved treats in Russia. Many reasons can be attributed for their status: originality, distinct Russia taste and highlight the ingredient, nature, and Kinds Of Fruits You Can Find Only In Russia. Moreover, it also marks Russian history and harsh diver weather conditions.